I'm revising chapter three of current work. This is third time through. Or maybe the 6th time through, depending on how you count. I wrote it. Then I re-read it and separated it from other content. Then I made it a chapter. Then I revised it. Then I re-read and cut it down to size, killing language all the way. Now I'm fixing it. But everyone in it is behaving too nicely. It's got no teeth. Plenty of fangs everywhere else, but no teeth in chapter three and it's Christmas in chapter three and in honour of July, I melted all the snow, even though it takes place in a northern town in a nuclear family who are all kind. How can this be? What to do about it? Do you know kind families -- ones where strangers feel welcome and are fed and sheltered? Where family secrets are alien things and where people punch each other out of joy? I'm going to have to do something about it tonight. Stay tuned. 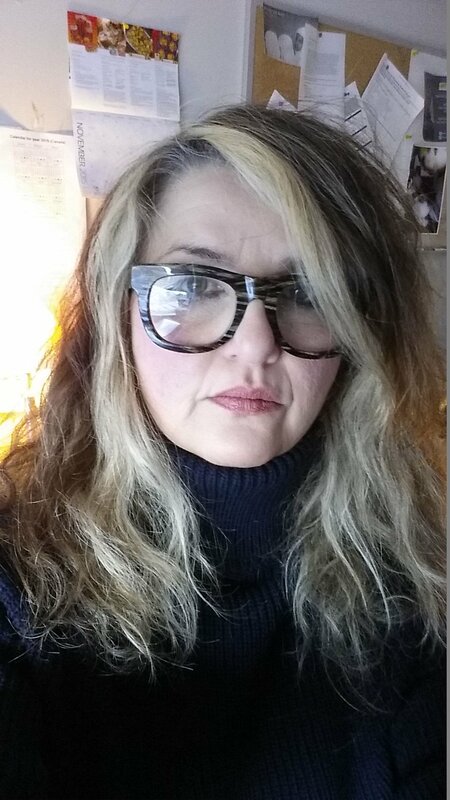 This is me in a turtleneck, favourite sweater, favourite colour, old glasses, kind of an old picture. My hair's still a mess and lips are still lopsided and blue is still best.